On the hunt for more exciting vegetarian food to add to our repertoire we stumbled across award-winning vegetarian chef Eddie Shepherd and his supper club which is literally 10 minutes down the road from us. Eddie hosts a small number of vegetarian and vegan supper clubs every few months at his home within The Walled Gardens in Whalley Range Manchester, with only 8 places per session. Tickets are £50 for 12 vegetarian courses, a welcome glass of prosecco, tea, coffee and takeaway chocolates. Tickets to these intimate supper clubs sell out within 30 minutes so you do have to keep your eyes peeled if you want to be in for a chance to snap them up. We were initially a bit apprehensive about going to a chefs home and having lunch sat with six strangers around one communal table but Eddie instantly made us feel at home and everyone who joined us were so friendly that we happily chatted through our 5-hour sitting. We've been to a few tasting menus before, including one at The French while it was still being run by Simon Rogan, but the theatre and quality that Eddie produced far surpassed what we'd expected and had before. As the dining table is right next to Eddies's kitchen you can watch him intricately creating each dish full and he's more than happy to answer any questions as he crafts away, something you wouldn't usually get unless you fork out hundreds to sit at the chef's table in a fancy restaurant. The menu is a compilation of flavours, textures and technical processes that come together with such precision and attention to detail that you wouldn't feel out of pocket paying double or triple the price in a Michelin star restaurant. We won't talk you through each course as the menu changes regularly from season to season, but instead, we thought we'd just talk you through some of the real stand out dishes for us with plenty of visual candy to whet your appetite too. The evening starts off with Eddie's signature Butterfly tea which requires audience participation and gives you an insight to the delights that follow. In front of you, you'll get a glass of ice and dry ice, along with a miniature teapot filled with a floral tea mix. 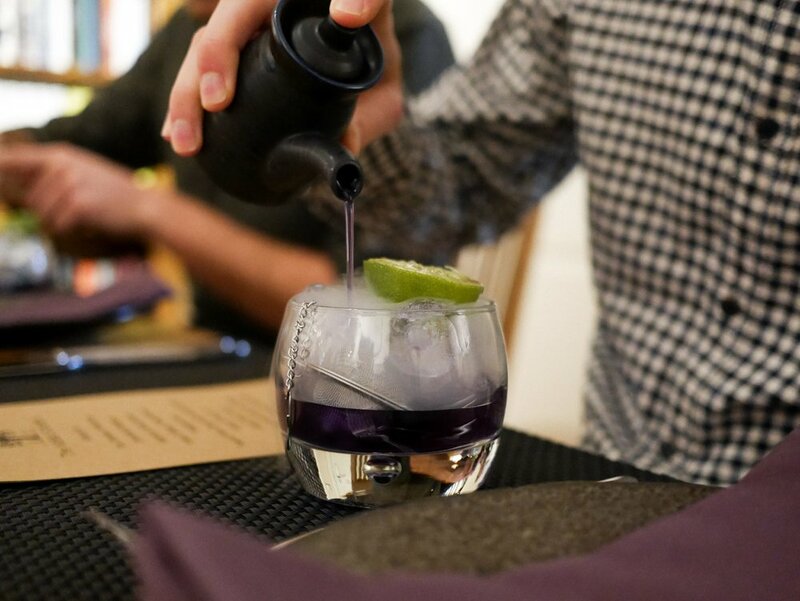 Pour over the teapot and expect a mystical purple cocktail complete with plenty of mist supplied by the dry ice. Squeeze over your lime segment and you've got a refreshing flavour concoction that really tickles the tastebuds. 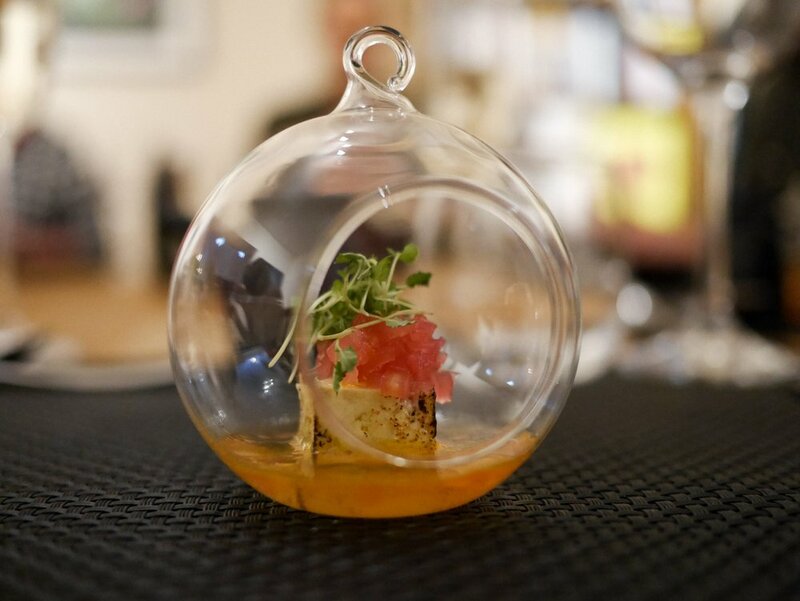 The dish that immediately follows is as equally full of participation as you're told to go and pick your dish which is hanging from the ceiling posing as an intricate glass bauble decoration. Inside you'll find tofu, dandelion and pickled apple a sweet and tangy combination of ingredients that Eddie has foraged. Another highlight has to be the Mushroom, Vanilla and Beetroot which is the meatiest vegetarian dish known to man. The cured portobello and field mushrooms had undertook a series of dehydrating and rehydrating with various stocks and other processes to create the most umami dish imaginable paired with the sweetness of the vanilla and the earthy beetroot it's delicately balanced. The vegetarian homage to fish and chips was another stand out to us. Battered halloumi, fried potato cubes, pea purée and dill - literally could have eaten platefuls of this one. With regards to drink it's bring your own although Eddie does provide homemade cordial of apple, lemon and thyme which can be added to your welcome prosecco or drunk throughout your meal instead.